The PMI VectorLink Project works to assure that its vector control activities mitigate negative environmental impacts and accentuate the positives in all targeted communities. To accomplish this, PMI VectorLink uses a variety of innovations, from the use of smartphones to monitor environmental compliance/safety of IRS program implementation, to developing mobile soak pits to assure the safe disposal of liquid insecticide wastes in remote areas. Additionally, the project has partnered with various local environmental organizations in its project countries, to reuse or recycle byproducts from annual IRS campaigns that would once have been incinerated or disposed of in landfills. Mobile soak pits provide operational flexibility and reduce construction and labor costs over building permanent soak pits. PMI VectorLink uses ECAP – a comprehensive system of assessments, reports, corrective actions, and follow-up inspections – to address the environmental health and safety aspects of spray activities, the security of facilities where insecticides and other hazardous materials are stored, and the safe handling and transport of insecticides. ECAP not only provides clear direction on what must be done, it also enables management to have a clear, real-time picture of the status of environmental compliance preparations. PMI VectorLink trains and supervises workers to ensure that they understand—and embrace—environmental health and safety best practices for all IRS campaign activities. To supervise operations, reinforce basic environmental compliance concepts, and ensure that compliance is well-documented, PMI VectorLink has trained IRS campaign staff to complete checklists while monitoring IRS programming. The checklists cover a variety of topics to assure thorough supervision of IRS activities. PMI VectorLink uses a mobile phone application for environmental compliance, with which project staff can complete and have access to all environmental assessments and inspections electronically. The data collected is uploaded to an online database, and a work list is automatically distributed to assure that the operational sites (base of IRS campaign field implementation) are prepared for the spray campaign, noting for example whether soak pits need rebuilding before spraying can start. Inspection results are immediately available to management staff in country offices and in the U.S. home office. Fast access to this data provides timely notification of areas where enhanced supervision and reinforcement of key environmental compliance issues is needed, and allows timely corrective action. The smart phone also has photo and GPS capabilities, which provide verification of site conditions and location, and validation of the data record itself. PMI VectorLink countries often use insecticide that is packaged in plastic bottles. Since both incineration and burial of the bottles can create environmental hazards, PMI VectorLink develops partnerships with local environmental organizations to recycle the plastic bottles. After the bottles are collected and rinsed by the project country teams, the bottles are transported by the local environmental organization to the recycling centers, where the plastic bottles are crushed, ground, and re-manufactured into a variety of new materials that are readily needed in the project country. For all IRS programs, soak pits – large, in-ground filters – are used to dispose of liquid wastes from rinsing spray tanks and washing spray operators’ protective gear. These soak pits adsorb and safely degrade the traces of insecticide found in the wash-water. In most spray areas, soak pits are more or less permanent installations built of concrete, stone, and carbon, in a central location that spray teams can access at the end of their spray day. However, in some hard to reach areas, it is difficult and sometimes impossible for spray teams to return to a soak pit for clean-up purposes. For this reason, PMI VectorLink uses a mobile soak pit. Developed under the PMI Africa Indoor Residual Spraying Project, the mobile soak pit is a 20-27-quart container with layers of stone, activated carbon, and sawdust that can be installed almost wherever a spray team completes their daily operations. Since the mobile soak pit weighs about 15 kilos, it can be carried to a spray location, installed at a wash site in minutes, and used to catch and treat insecticide waste. 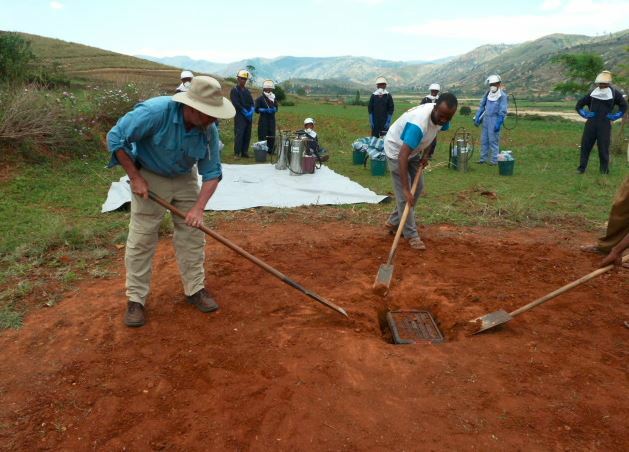 When spray operations in the area are complete, the soak pit is dug-up and carried away for use at the next location, while the site is restored to its original condition. The mobile soak pits provide operational flexibility and reduce construction and labor costs over building permanent soak pits, as PMI VectorLink estimates a mobile soak pit is 80-90 % cheaper to construct than a permanent soak pit. Furthermore, they are better for operator health because cleanup can be performed immediately after completion of daily spraying, rather than having to travel to a central location. They also improve control over potentially hazardous wastes, because the wastes remain in the mobile soak pit, rather than in the ground.